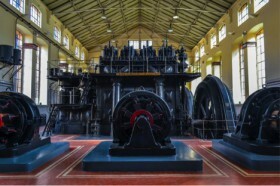 At this year’s annual congress in Madrid, Europa Nostra’s Industrial and Engineering Heritage Committee (IEHC) will organise its traditional industrial heritage excursion. The excursion starts with a brief visit to Madrid’s Waterworks “Canal de Isabel II” to be followed by extensive visits to Madrid’s Metro Transport System, inaugurated by King Alfonso XIII in 1919. It is the oldest subway system in Spain and one of the 10 oldest in the world. The system boasts an original depot and workshops, which serve both modern and vintage trains, an electric power station and an abandoned or “ghost” subway station. The subway represents a combination of still good functioning, partly preserved, but not fully recognized and hence endangered industrial heritage. Transport will be by bus and metro and a packed lunch will be provided.